We are given the context of today’s story: it took place as Jesus was “returning from the district of Tyre”. He was passing “by way of Sidon towards the Sea of Galilee” and this brought him “right through the Decapolis region”. This reminds us that we must know how to leave our ordinary surroundings so that we can meet people like this man. Today’s gospel passage is a healing story. We must be careful to interpret these stories correctly. For example, we would be wrong to draw the conclusion that since Jesus healed miraculously, all his followers are called to do the same. That would be to misunderstand the meaning of the miracles. St John gives us the key to interpret Jesus’ miracles. Whereas the other evangelists refer to the miracles as “wonders” or “powers”, John calls them “signs”; for him the miracles point beyond themselves to the “kingdom of God”. This is the world as God wills it to be. It is what Jesus lived and died for. The miracles therefore are living lessons on the kingdom. They are also signs that the kingdom is already present in the world. We can see fleeting glimpses of it, its first fruits, its heralds. Jesus’ miracles are like the educational films made nowadays which show the processes of nature speeded up. They are “fast forwarded”. 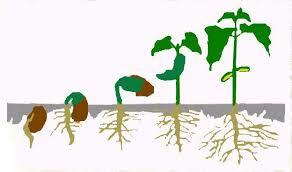 For example, we see in one continuous movement a seed germinate, become a bud then a beautiful flower, and then spread new seeds. In somewhat the same way, Jesus’ miracles display (and announce the arrival of) God’s plan for the world. They “go against nature” but only in the sense that in them God’s kingdom comes instantaneously, whereas in real life it takes considerable time and plenty of painful effort. The person in this story can neither hear nor speak and is therefore a truly touching symbol of those who cannot communicate. They cannot hear God’s word of truth, wisdom and consolation, the words of those who would like to enter into communication with them. They cannot hear the life-giving words spoken by nature, the truth of themselves, the greatness or the weakness of their own beings. The “impediment” in his speech symbolizes well our inability to initiate conversation – with God, other human beings, nature, oneself. The phrase “the ligaments of his tongue were loosened” tells us that the power to communicate is within us all. It is kept in check by the negative forces within us, like fear, hurt and anger. “He spoke clearly” is also a very telling phrase – it refers to the great wonder of good communication, a power we have within us, if we can only do it right. Jesus takes the man “aside in private”. This is surely an indication that his healing often requires intimacy. When we try to do it publicly, we run the risk of using persons to bolster our ego or for our personal ambition. The healing process in this story is very physical. Jesus “puts his fingers into the man’s ears” and “touches his tongue with spittle”. This reminds us that the meeting of bodies is very important in the ministry of healing. Jesus also “sighs”; this is telling us that he takes on himself the pain of the man. He “looks up to heaven” – a sign that he knows the source of his healing power is there. It is also a sign of a deep respect before the person’s vulnerability. The passage concludes with one of the several stories of Jesus imposing what biblical scholars have called the “messianic secret.” At present, scholars are divided on the issue. Some think of the deep significance of this mysterious aspect of Jesus’ ministry, a meaning which is always manifested slowly. We need to enter into this mystery as we can. My own feeling however is different. I take it to mean that the “secret” of Jesus reminds us that as always we must interpret the story of Jesus from our own experience. Jesus is then the model of those who choose to minister from the truth of who they are. He does not start from the false idea of what status society finally confers on them. This is always Jesus’ point of view. He is always there to help people, to make sure that the deaf hear and the dumb speak. Those who had little or no capacity for communication are now able to speak clearly. – spiritual guides approach their work like busy professionals. people who feel very deeply the pain of the person entrusted to them so that in communion with them they will raise their eyes to heaven and sigh. so that they will feel able to speak clearly the truth of what they feel. – they are fearful of being rejected and cannot risk saying what is within them. but will sigh as they feel the pain of those they are listening to. at their touch, ligaments of tongues will be loosened and speech will flow. – people of deep faith categorised by majority religions as pagans or idolaters. They have heard no words of love or even of respect and are impeded from sharing what is most important to them. and they can feel a human presence which will loosen the ligaments of their tongues. Lord, we thank you for Charismatic Renewal in our Church. 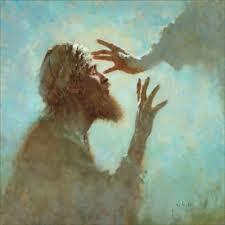 Through Life-in-the-Spirit seminars many have been brought to Jesus to have him lay hands on them. as if they had an impediment in their speech now speak clearly and freely in joyful praise. when he ordered those he healed to tell no one about it. sharing their common humanity and feeling their pain. religious belief and practice, long-standing territorial disputes. of communicating with each other. and they cannot speak without being misunderstood. so that their ears will be opened and they will be able to speak clearly. Lord, we thank you for revealing to us the deep meaning of your messianic secret. who can now be introduced into the great mystery of human communion. The Rite of Blessing and Sprinkling Holy Water (Missal, p 387) is appropriate because the gospel is that of Jesus restoring hearing and speech to the deaf man with the speech impediment. the Lord touched our ears to receive his word and our mouths to proclaim his faith. Now we have gathered together to listen to his word and to proclaim that faith. So, let us ask God to bless this water, which we will use to remind us of our baptism, and to keep us faithful to the Spirit he has given us. This healing, which follows the pattern of healings in Mark, is intended to be read as one more indication of the arrival and nature of the messianic times. Each healing and each miracle is like a pointer to one more aspect of Jesus as ‘the Christ’. At the end of the healing, the crowd’s reaction and amazement is a direct allusion to the reaction described in Isa 35:5-6; and for Mark, the healing taken with the reaction is an indication that the glorious future, which was long awaited, is already a reality in Jesus. But there is still the ‘messianic secret’ when Jesus orders them to tell no one of the miracle, yet the more he tells them this, the more they ignore him. Mark is anxious that no one should think of Jesus just as a healer: the messiah only becomes truly visible in the cross and resurrection. Since this miracle is only found in a much cut-down form in Matthew (15:29-31), this is a very good place to see just what a distinctive theological voice Mark had. Moreover, the details of the Ephphatha, which has had such a profound impact on the liturgy of baptism, is only found here. 1. Better than just a homily today is to have a little ceremony of ephphatha, and then perhaps say a few words. However, if that is not possible, then here are some notes. 2. There is a little ritual in the rite of baptism — alas it is often omitted — whose name and form is taken from today’s gospel: ‘The Ephphatha’. The celebrant touches the ears and then the lips of the one to be baptised saying: ‘The Lord Jesus made the deaf hear and the dumb speak. May he soon touch your ear to receive his word and your mouth to proclaim his faith …’ This simple ceremony captures not only what is the kernel of today’s gospel, but a most profound aspect of our faith: its ‘giftedness’. 3. In the first reading we hear the prophet describing the people in terms of their disabilities: stumbling, hard of hearing, with poor sight — the sad reality of the human condition. But holding out the promise of God’s help, and aid, and mercy: the gift of the Promised One will be the gift of new sight, new hearing, and new lips. And the miracle in today’s gospel is a demonstration that this time has come: Jesus is the gift of the Father to us. 4. The gift of new sight shows us the true nature of the creation: the universe exists in dependence on God’s will; we human creatures exist because of his love, and our destiny is not within the creation, but in union with God. 5. The gift of new hearing allows us to hear the word of God in our gatherings, in the situations and ups and downs of life, and in our consciences. We can come to know that God loves us, cares for us, and calls us to be his ministers and his witnesses. 6. The gift of new speech allows us to praise him in prayer, to proclaim the truth to sisters and brothers, and to announce the good news of Jesus. 7. 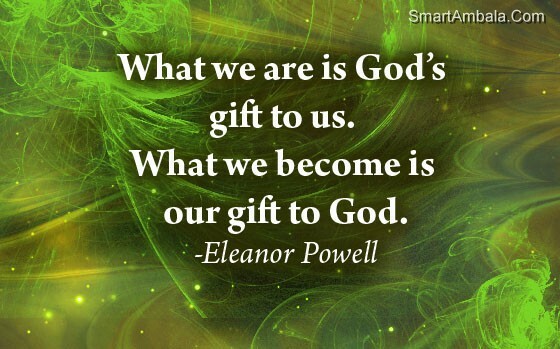 God’s gift to us is the gift of receiving and the gift of transmitting. We are enabled to hear the word of God, and we are empowered to communicate the word of God. In opening our ears and lips, Jesus gathers us up into his own divine life. This week stories of conflict are left behind as we are treated to further evidence of what Jesus’ ministry of proclaiming the kingdom of God is all about. The story begins with a rather flawed geography lesson. The sequence mentioned by Mark makes no sense but it may be that he is making a theological point because the places he mentions are the gentile surroundings of Galilee where the kingdom has been first proclaimed. The man brought to Jesus cannot hear or speak and is therefore cut off from the good news, but through Jesus’ healing touch he is restored and the response to this action is one of unrestrained praise and wonder. The people realise that in Jesus all that the prophets had spoken of so long ago is being fulfilled and Mark is also making the point that this ministry embraces Jew and Gentile alike. By the time of Jesus many religious traditions were in place which served to differentiate between those who were on the inside and those who were outsiders. This led to divisions, inequality and oppression — the very things that the covenant was supposed to eradicate. So when Jesus reached out to the poor, to sinners and those on the margins he was bringing into focus once again the kind of world God wanted. His was a love that included everyone and which could not be bought. In commanding that the ears of the deaf man be opened there is a message to us all, especially those who think that their hearing is perfect. Our ability to really hear the good news can be limited by many things, especially closed minds and hearts. Perhaps as individuals and as a community our prayer during this Sunday Eucharist might be that we would be opened to all the transformation that God wants to work in us. Isaiah’s vision of a Messiah who would come with hope and healing (today’s first reading) is realized in this episode from Mark’s Gospel: the deaf hear, the silent are given voice, the lame “leap like a stag.” The exhortation Ephphatha! is not only addressed to the man born deaf but to his disciples both then and now who fail to hear and see and speak the presence of God in their very midst. The Aramaic phrase ephphatha literally means “be released” – Jesus “releases” the man not only from his disability but from his sins, his isolation from the community, his alienation from God. Jesus’ curing of the deaf man with spittle (which, in Jesus’ time, was considered curative) is an act of re-creation. God’s reign is present in human history in the extraordinary ministry of Jesus. Throughout Mark’s Gospel, Jesus insists that his healings be kept quiet in order that his full identity be revealed and understood only in the light of his cross and resurrection. Jesus restores the deaf man’s hearing with the word Ephphatha – “Be opened!” We, too, can bring healing and life to those who need the support, the affirmation, the sense of loving and being loved that the simple act of listening can give. In times of grief, despair and failure, we can be “deaf” to the presence of God in the love and compassion of others; or we can become so preoccupied with the noise and clamor of the marketplace that we are unable to hear the voices of those we love and who love us. Jesus not just cures the man with a fleeting word but, by his touch, he enters into the grit and grime, the struggle and pain of the man’s life and, in doing so, brings hope and healing to the man. Listening ‘funny’ . . .
A mother was planning a birthday party for her six-year-old son. She wanted to protect him from the social consequences of inviting Jason, an unpopular child, to the party. Jason stuttered, so he was constantly teased, often cruelly. But Mom realized that her son had to make the decision on his own. Mom was pleasantly surprised to discover that her son not only could take care of himself but also stick up for his friend. We often listen "funny." Fear and ignorance often distort our ability not only to hear but also to see the good in the midst of bad, the reasons to hope in the midst of despair. 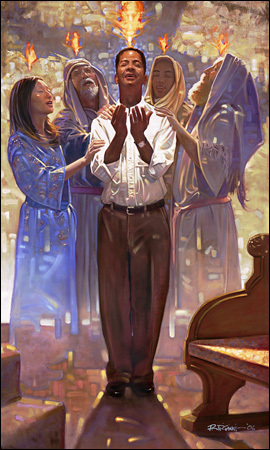 The words Jesus speaks to the deaf man in today's Gospel – “Ephphatha” -- are spoken to us, as well: that our hearts and spirits be “opened” to accepting God's love from those who are “different” and “uncool”; that our hearts and spirits be “opened” to realizing God's presence in times and places that make us squirm; that our hearts and spirits be “opened” to realizing God's grace despite our difficulty to trust, to accept, to understand. We have come to associate the good news of salvation with something that is going to take place in the distant future, as something purely spiritual. But Scripture pictures salvation in more realistic and physical terms. In today's first reading Isaiah reminds the people that God will save them and they will experience tangible signs of his power and loving care for them. The message of the prophet is loud and clear to all who believe in God. We may be living in difficult times, we may be faced with uncertainty. What is God saying to us? His promise is not something for the distant future but will be realized right now. He is coming to save us and He will give us signs of his presence. Are we open to His touch? Can we believe that His hand is there in all that is happening to us today? "Be open!" We all know Helen Keller, whose story we read or watched in the play or movie 'The Miracle Worker'. Helen wrote in her autobiography the key experience in her life: "The most important day I remember in all my life is the one in which my teacher, Annie Mansfield Sullivan, came to me. I stretched out my hand as I supposed it to be my mother. But someone took it, and I was caught up and held close in the arms of someone who had come to reveal all things to me, and more than all else to love me." Annie Sullivan did give the child enormous love, but she also gave her firm and, at times, violent discipline. Annie's combination of very tender and warm love and very stern and uncompromising discipline touched this child deeply and made her into a human being and a very great one at that. Even a cynical soul as Mark Twain, who got to know Helen Keller, reckoned her as one of the most interesting figures in the nineteenth century, because she had conquered her own physical limitations to become a beautiful and noble lady. In today's Gospel we see Jesus dealing with the man who was deaf and dumb and we can receive many insights for our own life from contemplating the scene. Firstly, we are reminded that the man was brought to Jesus by others who implored Jesus to lay his hand on him. There are times when we cannot help ourselves and we need others to bring us to Jesus. When we come across people who are hurting and helpless, we need to bring them to Jesus. Secondly, we are told that the man was deaf and also had an impediment in his speech. We might say that we have no such problem, we can hear well and we have no problem speaking. But have we no problem? Can we really hear? Can we hear what people are trying to say to us? Can we hear what the situation we are in, is saying to us? Can we hear what God is saying to us? In Jesus' response to the man who was brought for healing, we see the compassionate love and care of Jesus for him and for all who need his healing touch. The gospel tells us that Jesus took him aside from the crowd. He deals with him on a personal level on a one-to-one basis. 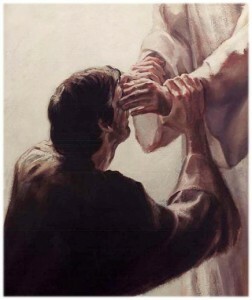 Jesus spends time alone with him, and touches him putting his fingers into his ears and spittle on his tongue. Jesus could have healed him from a distance but he draws close to him and gets involved with him and touches him and looking up to heaven, as if to remind all that His power comes from on high, He says: "Be opened! ", and the man was healed and he could hear and speak. He ordered the crowd to tell no one about it because he does not want them to come to him just to witness miracles but to come with faith for the touch of love, the touch of the Master's Hand, that is often felt in hidden, unobtrusive yet loving ways. A woman went to confession and confessed that she had been gossiping about others. As her penance, the priest told her to go to the market, buy an unplucked hen, and, on her way home, she was to pluck the hen, feather by feather, and let each feather be carried off by the wind. She did that, and returned to the priest. He praised her for her obedience, and he said "Now, there's one more thing to do. I want you to go back along the road, and pick up every feather belonging to that hen." The woman was dumb founded. The task was impossible. By now, the wind had scattered those feathers miles away, out across the country. "Exactly", said the priest. "Now you see what happens as a result of your gossiping. It is impossible to call the words back, once you sent them on their way. Be very very careful what you speak, and especially what you gossip. It is almost impossible to repair the damage." A working man was strongly drawn towards a beautiful vase he saw in a stall down in the town market. He bought the vase and brought it home. The vase was so beautiful that it made his front room look drab, dull, and indeed plain ugly. So he got bright paints and transformed the whole house. He got colourful curtains to match the paint, a brightly patterned carpet, and he even stripped down and varnished the furniture. Because of the beauty of the vase the whole room was transformed. 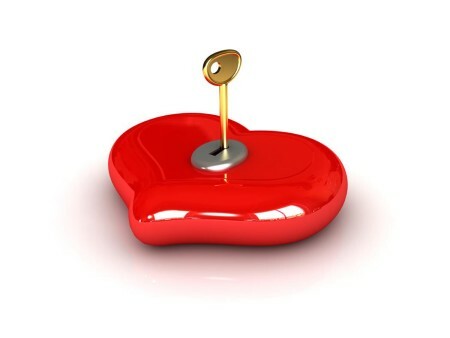 - When Jesus enters my heart, the areas in need of attention become, oh, so obvious. Holiness consists in discovering that I am a much bigger sinner than I ever thought I was! The closer I come to God the more obvious the contrast! When Jesus comes, his touch, his presence makes all the difference! 1) "I want to be alone." That was the famous declaration made by the early Swedish film star and glamour girl Greta Garbo (1905-1990). But it was that declaration that jinxed her search for solitude. A vast cast of has-been, over-the-hill actors and actresses struggled to stay in focus but swiftly faded out of the limelight and into obscurity. But Garbo, by her very insistence on alone-time, was hounded by media hangers-on until her death in 1990. To get a picture of Greta Garbo remained a paparazzi "holy grail" throughout her life. We are more alone and less alone these days than ever before. Humans have always lived in communities, in tribes, in families - for protection, for food, for companionship, for love. In the twenty-first century urban living is the norm, with large populations of people gathered around a commercial/communal core. But even as we live lives more closely packed, we are more solitary. Education and economics have made it possible for more people to "make it" on their own. What for centuries had been the culturally and economically determined "norm" - to marry and produce a family in order to survive - is no longer viewed as a necessity. In America, the new norm is singledom. Half of all adults are unmarried, and 15% of those singles live by themselves. In Scandinavia it is estimated that by 2020 half of all "households" will be occupied by only one individual. In Keeping Pace, Ernest Fitzgerald relayed the true story of a magazine company which several years ago purchased a new computer. Its function was to compile data and send out subscription notices to customers whose subscriptions had lapsed. One day something went wrong with the machine, and before the error was discovered (about a month later), a certain rancher in Colorado had received 9,374 notices that his subscription had expired. Someone in the magazine office posted the letter the company received from him. Inside was a check for one year's subscription along with a handwritten note saying: "I give up! Send me the magazine." He was won over by their consistent, persistent attention. That's what still wins people over to Christ. It's the consistent witness we live before them: the kindness and gentility that are consistently evident, the willingness to listen without judging and to help without expecting something in return, the smile that's always there, the warm hug or handshake that we can count on, the friendship that doesn't blow hot and cold, the faith that is evident in good times and other times, as well. We articulate Christ's presence and power most effectively not with eloquent words but rather with a steady, faithful Christian life that others can see and believe in. It may come as a shock to most Christians today, but we would do better to use this woman as a model of faith even more than the disciples. After all, we are neither Jewish nor Galilean; we have no familial claim or geographical claim to Jesus. While the woman learns that the power of faith lies internally, the disciples learn that faith can't be measured by proximity to Jesus. They are right next to the Lord and yet they see the woman as a bother. They don't lead her to Jesus or attempt to heal her daughter, her faith does that. They are too blinded by their social and religious prejudice to offer miracles to anyone. Jesus words are obviously not meant to cut down the woman (her compassion runs too deep to care if she is insulted). The words of Christ are meant to reprimand the disciples-and us-when our politics and religious agenda blind us to compassion. Which faith most resembles mine? Am I like the cocksure disciples steeped in religious and cultural prejudice, deeply self-assured of my proximity to Jesus? Or, am I like the outcast woman of Lebanon, indentured by compassion and uncaring of insults if I can just save one soul? I have a friend who is a surgeon and a committed Christian. He is the physician who took care of me when I had a snow blower accident and needed surgery on two fingers. During one of the surgeries (all done with local anesthetic), I asked, "Don, do you believe in divine healing?" "Is there any other kind?" he responded. Good point, but what I really wanted to know was whether he believed in what we would call miraculous healing, so I asked, "Actually, I wanted to know if you believe in miraculous healing." "Yes," he answered in a matter of fact way, "Why do you ask? Do you want me to stop the surgery?" John Jewell, What About Healing? If you put a buzzard in a pen that is 6 feet by 8 feet and is entirely open at the top, the bird, in spite of its ability to fly, will be an absolute prisoner. The reason is that a buzzard always begins a flight from the ground with a run of 10 to 12 feet. Without space to run, as is its habit, it will not even attempt to fly, but will remain a prisoner for life in a small jail with no top. The ordinary bat that flies around at night, a remarkable nimble creature in the air, cannot take off from a level place. If it is placed on the floor or flat ground, all it can do is shuffle about helplessly and, no doubt, painfully, until it reaches some slight elevation from which it can throw itself into the air. Then, at once, it takes off like a flash. There was a fifth grade teacher who decided that she would use this listening process with her children. Every morning for five minutes she required them to be totally quiet. That's hard for any of us to do, much less a fifth grader. She discovered that a great deal of good came from the experience of silence. After one of these quiet times she asked the students if they had heard anything. One boy said: Yes, I heard something say that I should be more obedient to my parents. Another said: I heard something say that you should always be fair: When you are tagged and nobody sees it you are still out. There is no substitute for listening. A psychologist friend of mine once developed a personal growth seminar entitled, The Friendship Mirror. It began with an exercise in which you were asked to write down the names of ten people you consider to be friends - people you enjoy being with ... people you like ... people you feel most comfortable relating to. Then he'd ask you to describe them in terms of their age, race, height, weight, education, views, whether they're married or single, with children or not. When you finished, what you found was a striking similarity between the people you like the best and ... are you ready for this? Yourself! Surprise! We tend to identify most easily with those people who are like us. "Birds of a feather flock together," they say. Which is nothing new, of course, but it's something we do well to be reminded of, from time to time, for to grow up is to grow out and to mature in faith is to widen your circle to include those who don't just mirror your image, but challenge you to think and act in new ways. If we believe in Jesus, we know the boundaries are erased inside and out, life's for us all. Fred Craddock tells the story of a missionary sent to preach the gospel in India near the end of World War II. After many months the time came for a furlough back home. His church wired him the money to book passage on a steamer but when he got to the port city he discovered a boat load of Jews had just been allowed to land temporarily. These were the days when European Jews were sailing all over the world literally looking for a place to live, and these particular Jews were staying in attics and warehouses and basements all over that port city. It happened to be Christmas, and on Christmas morning, this missionary went to one of the attics where scores of Jews were staying. He walked in and said, "Merry Christmas." The people looked at him like he was crazy and responded, "We're Jews." "I know that," said the missionary, "What would you like for Christmas?" In utter amazement the Jews responded, "Why we'd like pastries, good pastries like the ones we used to have in Germany." So the missionary went out and used the money for his ticket home to buy pastries for all the Jews he could find staying in the port. Of course, then he had to wire home asking for more money to book his passage back to the States. As you might expect, his superiors wired back asking what happened to the money they had already sent. He wired that he had used it to buy Christmas pastries for some Jews. His superiors wired back, "Why did you do that? They don't even believe in Jesus." He wired back: "Yes, but I do." Generations of preachers at Princeton Seminary were schooled in their homiletical skills by Dr. Donald Macleod. Among the points Dr. Macleod would make during the semester was the importance of choosing a compelling sermon title. In fact, he asked students to give their sermon title before beginning each sermon. He used to tell of Mrs. O'Leary who would hop on the Fifth Avenue bus on Sunday morning in Manhattan and pass the great churches along that thoroughfare. As the bus would approach each church, she would eye the sign in front with the sermon title and decided, on the basis of what she read, whether to get off the bus and attend that church. Dr. Macleod's constant refrain was, "Pick a title that will make Mrs. O'Leary get off the bus." Once upon a time there was a lake which usually froze over in the winter. It was a great place to skate and very safe as long as the weather remained cold. Normally parents began to worry about the lake only after March 15 because the lake was in the Middle West where winter lasts till, like May, sometimes. Anyway, this one winter was quite warm (for the middle west) and little pools of water often appeared in the lake at the end of a day, though they froze again over night. The police warned everyone who lived near the Lake to be careful because the ice might be very thin in some places. Parents in turn warned their children, who, like kids often do, skillfully tuned out everything their parents said. So a lot of parents ordered the kids to stay away from the lake. Well, one week in late February there was a fierce cold spell and the Lake seemed to have returned to its old, icy self. The kids all wanted to skate. Teachers told them not to. Their parents told them not to. The kids listened and nodded dutifully. How, they said, could there be thin ice when it was so cold. Most of the kids, more because of fear of being punished then fear of the lake, stood on the shore and watched as five of them, three boys and two girls, shouting that the others were “chicken” skated all around the lake and had a grand old time. Then all five of them were for just a moment in the same place and, well . . . You know what happened. There was a sound like someone had fired a gun. The ice cracked all around them and they were suddenly on an ice island in the middle of the lake at least twenty feet from any other ice – which was still cracking and breaking up. Then the little ice island looked like it was going to sink. Then one little boy, the worst chicken of all because he was smart, ran into a house and called 911. In ten minutes a police helicopter arrived and lifted the five kids off the ice island. Do I have to tell you what the cops said to them? Or their parents? Or how long they were grounded from skating? At the Annual National Prayer Breakfast on February 2, 1984, Ronald Reagan, the former president of the United States, told the old story of "the little monk," Telemachus, a martyr whose self sacrificing commitment to Christian ideals opened the blind eyes and deaf ears of the Romans and their fifth century Christian emperor Honorius. According to the story, this Turkish monk was led by an inner voice to go to Rome in order to stop the cruel and inhuman gladiatorial fights between slaves. He followed the crowds to the Coliseum where two gladiators were fighting. He jumped into the arena and tried to stop them, shouting "In the name of Christ, hold back!" The gladiators stopped, but the spectators became indignant. A group of them rushed into the arena and beat Telemachus to death. When the crowd saw the brave little monk lying dead in a pool of blood, they fell silent, leaving the stadium, one by one. Three days later, because of Telemachus' heroic sacrifice of his own life, the Emperor decreed an end to the games. In today's Gospel, which describes the miraculous healing of a deaf mute, we are invited to open our ears and eyes, loosen our tongues and pray for the courage of our Christian convictions to become the voice of the voiceless. In the poem “The Touch of the Master’s Hand,” Myra Brooks Welch tells the story of the auctioning of an old dusty violin. The violin was about to be sold for a mere $3 when a grey-haired man stepped forward, picked it up, dusted it off, tuned it and began to play. The man played such sweet music that, when he finished, the bidding jumped into the thousands of dollars. What transformed the dusty old violin into a precious instrument? The touch of the Master’s hand. The same “touch of the Master’s hand” continues to transform our lives today. By God’s touch we become His instruments to accomplish the marvelous works described in today’s Psalm 146: to secure justice for the oppressed, give food to the hungry and set the captives free. Two older men were talking. One of them was bragging just a little bit. "I just purchased the most expensive hearing aid ever made," he said. "It is imported and is guaranteed for life." The second man asked: "What kind is it?" The first man answered, "Five past two." We can laugh about the hearing loss that comes with aging. It is a minor problem that will affect most of us sooner or later. In fact, experts predict that years of rock music, leaf blowers, and noise pollution in general will result in millions of baby boomers with hearing loss. According to a recent study by the National Institutes of Health, there has been a stunning 26 percent increase in those suffering permanent hearing loss between the ages of 35 and 60, compared to 15 years earlier. (With Adam Hanft, Dictionary of the Future (New York, NY: Hyperion, 2001), p3. Today’s gospel passage tells us how Jesus healed a deaf man who was mute. 1) Ludwig van Beethoven: Did you know, by the way, that the three most popular languages in the United States are English, Spanish, and American Sign Language? There are more non-hearing people in our land than you might imagine. One of the saddest instances of deafness that I know is that of the immortal composer of classical music, Ludwig van Beethoven. For a musician, deafness would be the tragedy of tragedies. As he himself wrote on one occasion, “How sad is my lot! I must avoid all things that are dear to me.” There was a terrible time when Beethoven was struggling to conduct an orchestra playing one of his own compositions. He could not hear even the full orchestra. Soon he was beating one time and the orchestra was playing another, and the performance disintegrated in disaster. There is a pathetic picture of him after he had given a piano recital, bent over the keyboard, oblivious to the applause that thundered about him. He wrote on another occasion, “For two years I have avoided almost all social gatherings because it is impossible for me to say to people ‘I am deaf.’ If I belonged to any other profession it would be easier, but in my profession it is a frightful state.” Beethoven died a broken, bitter man. You and I who have our hearing, have our vision, who are able to get around with a minimum of impediments, ought to thank God every day, and we ought to salute those who overcome obstacles that we cannot even imagine. 2) “You have turned to medicine and drinking, and you are killing yourself.” W. Moore, in his book, When All Else Fails, Read the Instructions, tells about a “made-for-TV” movie years ago titled The Betty Ford Story. The movie was produced with the help, the support and the encouragement of former First Lady Betty Ford, to reveal, out of her own personal experience, the dangers of drugs and alcohol. Mrs. Ford was overwhelmed by the demands and stresses of being this nation’s first lady and by the debilitating pain of arthritis. Consequently, over time, she became addicted to pain medication and alcohol. In the most powerful scene in that movie, her family confronts Mrs. Ford, and one by one, her children express their love and their concern for her. And then straightforwardly, they tell her what they are seeing–that she has become a prescription-medicine addict and an alcoholic. At first, she denies that she has a problem, but eventually she realizes what is happening and gets help. In that poignant intervention scene, one of the children says this to her, “Mother, always before, when you had a problem, you turned to God and to your family, but lately you have shut us out. You have turned to medicine and drinking, and you are killing yourself.” Sometimes the most loving thing you can do for someone is to tell them–in love–the brutal truth. Betty Ford’s family loved her enough to help her see herself as she really was. As long as there is someone who cares for us, there is hope. That is the first thing we need to see. And here is the second thing: No one is hopeless who is open to Jesus. That is why someone brought this non-hearing man to Jesus. 3) Deaf Heather Whitestone did that. When Heather was a child, Daphne, her mother, was advised to send Heather to a school for the deaf and not to expect her to receive more than a third-grade education. But her mother had greater ambitions for Heather. With her mother’s encouragement Heather has been able to turn a hearing disability into an asset. Many of you will recognize Heather Whitestone’s name as Miss America 1995. In Heather’s hometown there is a poster featuring a photo of Heather, taped on a storefront. The poster reads: “They said she would only be able to get a third-grade education. Fortunately, she wasn’t listening!” (Denise George, “Capturing a Nation’s Heart,” Pursuit, Vol. III No. 4, p. 26). Today’s Gospel tells us how a deaf and mute man receives Jesus’ healing touch. 4) The healing touch: The Elephant Man, is a play about a real person. The “Elephant Man” was terribly deformed. People who saw him were repelled. If you saw the play, you will remember his meeting with Mrs. Kendall, an actress who befriended him. He offered her his less-deformed hand, but Mrs. Kendall shakes her head, making it clear that she wants to hold his horribly deformed hand. It takes several minutes for him to summon up the courage to hold out the other hand. Finally, Mrs. Kendall takes it into her hand and holds it affectionately for a minute. Then she leaves. Just before the curtain falls on Act I, the Elephant Man says, “This is the first time I have ever held a woman’s hand.” And much of the spiritual healing that occurs in his life follows this very simple incident. The medical community has been telling us about the therapeutic value of touching. For example, monitoring equipment can measure the effects of the healing touch of a nurse on a patient. The heartbeats of intensive care patients often can be stabilized when a caring nurse holds a patient’s hand. The effects are measurable. A few years ago, in some orphanages in South America, many of the young children were dying mysteriously although they were well fed. Dr. Rene Spitz, who studied this phenomenon, concluded that the babies were dying for lack of touch, for lack of the love that is communicated through touching. Henri Nouwen, author of many spiritual books, has written about his experiences in South America, working among the poor. He talks about the children who come and stand beside him, not looking for a handout, but hoping to be hugged, to be touched, to be loved. They want that more than anything else, he says. Today’s Gospel tells us a story of Jesus’ healing touch, conveying the transforming power of God’s love, which healed a dumb man. 5) “It simply depends on what you are listening to.” A number of years ago, I heard a story about a Native American, a Cherokee, who was in downtown New York walking with a friend who lived in New York City. As they were walking along all of a sudden the Native American stopped and said, “I hear a cricket.” His friend replied, “Oh, you’re crazy.” “No, I hear a cricket. I do! I’m sure of it,” he said. The New Yorker said “It’s noon. There are people everywhere headed to lunch, cars are honking, taxis squealing, there’s all the noise from the city. Surely you can’t hear a cricket above all that.” The Native America said, “Well, I’m sure I hear a cricket.” So he listened attentively and then walked about 10 feet to the corner where there was a shrub in a large cement planter. He dug beneath the leaves and found a cricket. His friend was astounded. But the Cherokee said, “My ears are no different from yours. It simply depends on what you are listening to. Here, let me show you.” He reached into his pocket and pulled out a handful of change, a few quarters, some dimes, nickels, and pennies. And he dropped it on the concrete. Every head within half a block turned. “You see what I mean?” as he began picking up all the coins. “It all depends on what you are listening for.” I wonder what the deaf man in the passage today started listening for? 6) Some of you know the name Max Cleland. Cleland is a former United States Senator from the state of Georgia. Max Cleland is a genuine war hero. He lost three limbs in Vietnam. How did he keep going? He says that one of the books that inspired him after his devastating injuries was an incredible story titled Reach for the Sky. This book is about Doug Bader, a fighter pilot of World War II. Doug Bader was a gifted young pilot in the British Royal Air Force before World War II. Just before the war, he was involved in a plane crash that changed his life forever. Both of his legs were amputated, and he was discharged from the R.A.F. as “totally disabled.” However, as Hitler hammered Great Britain in the blitz, England needed every available, trained pilot who could be found. Bader was proficient with his artificial limbs by this time, and desperately wanted to return to active duty. In an amazing and unbelievable turn of events, Bader was returned to active duty in the R.A.F. He had an incredibly successful record as a pilot. He shot down 26 enemy planes and achieved the rank of wing commander. But then he himself was shot down behind enemy lines. As his plane went down in flames, he managed to parachute to safety, but he left one of his artificial legs behind. On the ground, he was easily captured by the Germans. He became a P.O.W. But the story doesn’t end there. He escaped from the P.O.W. camp. When he was recaptured the Germans placed him in a maximum security prison. He remained there until the war was over. The Germans were so impressed by his courage that they allowed the R.A.F. to send Bader an artificial leg to replace the one he left in his crashing plane. When he strapped on the limb, the German officers raised their glasses in a toast of respect. The British celebrated the fifth anniversary of what Churchill called “The Battle of Britain” at the end of the war. Wing Commander Doug Bader was chosen to lead the fly past over London in honor of the occasion. For his incredible courage in World War II, Bader received the Victoria Cross, England’s highest military decoration. [Max Cleland, Going For The Max! 12 Principles for Living Life to the Fullest (Nashville, TN, 1999).] These stories of people who overcame the loss of one of their physical abilities are amazing. Have you ever noticed that Jesus seemed to have had a special love for people with handicapping conditions? 7) “There’s no bill now.”: One of the sad truths of life is that people with physical disabilities are often the recipients of abuse and humiliation from others. From a very young age, Henry Viscardi learned this cruel lesson. Henry was born with stumps instead of fully developed legs. He learned to walk well on his stumps, and he was capable of living a normal life, but the prejudices of others hurt him very much. When Henry was reduced to crying out, “Why me?” his mother told him a story that may trouble us theologically, but it helped young Henry. She said, “When it was time for another crippled boy to be born, the Lord and His councils held a meeting to decide where he should be sent, and the Lord said, “I think the Viscardis would be a good family to take care of him. '” It was just a simple story, but it made Henry feel he had a place and a purpose in life. He stopped asking “Why me?” and began making the most of his abilities. Henry did very well in school, and eventually graduated from Fordham University. After years of trying to walk like a normal person, Henry had damaged the skin and tissue of his stumps. He knew that without prosthetic legs, he would have to use a wheelchair. But no prosthesis could be found to fit him properly. Doctor after doctor said it was hopeless. But then one day, a German doctor committed himself to inventing a prosthesis that would work for Henry. It took a few months, but the German doctor finally created a workable pair of legs. For the first time in his life, Henry Viscardi looked and walked like a normal man. But when he tried to pay for the legs, the doctor refused to accept it. Here’s what he said to Henry, “There’s no bill now. But someday, if you’ll make the difference for one other individual–the difference between a life dependent on charity and one rich with dignity and self-sufficiency–our account will be squared.” Henry joined the Red Cross during World War II, and he dedicated himself to helping new amputees deal with their situation. When the war ended, Henry witnessed the problems that many disabled veterans had in getting jobs. So he gathered together a group of sympathetic business leaders and created Just One Break–or JOB–an organization that finds jobs for people with disabilities. Next, Henry started Abilities, Inc., with the same goal in mind. That was over forty years ago. Today, Abilities, Inc. has grown into the National Center for Disabilities Services. They run a school for children with disabilities. All their efforts are aimed at educating, empowering, and rehabilitating those with physical disabilities. As Henry Viscardi says today, “I can’t help but believe that the Lord had a plan for my life that made me the way I was and let me become who I am.” [Eric Feldman, The Power Behind Positive Thinking (San Francisco: HarperSanFrancisco, 1996), pp. 153-155.] Do you hear what he is saying? Henry Viscardi looked for God’s hand in his life, and he yielded himself to that leading hand and he accomplished far more than the majority of people with two good legs accomplish in their lifetimes. As long as somebody loves you, there’s hope. As long as you are willing to yield yourself to Jesus’ touch there is hope. This deaf man with the speech impediment had people who cared about him. They brought him to Jesus. And then this deaf man yielded himself to the Master’s touch. Looking up to Heaven, Jesus sighed and said to him, “Ephphatha,” that is, “Be opened.” And immediately this man’s ears were opened, his tongue was released, and he spoke plainly. 8) “Something in me wants to live.” Rachel Naomi Remen who has written a popular book titled Kitchen Table Wisdom is a medical doctor. She has learned through the years that the best healing of the human body takes place when the mind, body and spirit work together. She is “one of the earliest pioneers in the mind/body health field.” Dr. Remen understands the importance of Faith within the field of medicine because her first and most important mentor was her grandfather, a rabbi. Dr. Remen speaks of the “life force” in people. It is very similar to Schweitzer’s doctor within. She tells about Max, a sixty-three year old man who was sent to her because he had metastatic colon cancer. In the words of Dr. Remen, “The experts had given him daunting statistics and offered only a guarded prognosis.” Their work together had to do with helping Max to see where his life force was. You see Max had been born prematurely. As a tiny weak baby, he had absorbed his mother’s time and energy in the first few years of his life, which, for some reason, had enraged his father. As a little boy Max overheard an argument between his parents in which his father said, “If that little runt was one of the animals, I’d have put it out to starve.” That comment was devastating for Max. For the next 60 years he lived a self-destructive life that would have destroyed a weaker man. Dr. Remen reminded Max that despite his many brushes with death, the broken bones, the accidents, the risks he took almost daily, he was still here. She asked him what he thought had brought him through. “Luck,” he said quickly. She shot him a skeptical look. No one was that lucky. He sat for a while with his thoughts. Then in a choked and almost inaudible voice, he confessed that he had always wanted to live. She could hardly hear him. “Can you say that any louder?” He looked at the rug between his boots. Unable to speak, he just nodded. Almost in a whisper he said, “I feel ashamed.” Dr. Remen said that her heart went out to him. In a shaking voice he said, “Something in me wants to live.” His eyes were still fixed on the rug. “Say it, Max,” Dr. Remen thought. “Say it until it becomes real.” She wondered if she dared to push him a little further. “Do you think you could look at me and tell me that?” Dr. Remen asked Max. She could sense the struggle in him. Had she gone too far? He had never confronted his father. Most likely, saying such a simple thing out loud, “I want to live,” went against a lifelong pattern. Perhaps he would not be able to free himself even this little bit. With an effort Max raised his eyes, his voice still choked but no longer inaudible. “I want to live,” he said evenly. They stared at each other for a few moments but he did not drop his eyes. Dr. Remen smiled at him. “I want you to live too,” she said. And he did. Max went on to live eight more years. [(Penguin, 1996), pp. 12-13. Cited by Jean A. F. Holmes, http://www.npcpearl.org/Sermons/Sermon10292000.htm.] Imagine! If a conversation with Dr. Remen could have such an effect on a person, what could a contact with Jesus of Nazareth have done for him? Jesus’ works of healing should be the least controversial part of his ministry. Of course Jesus could heal, and he still heals today. Sometimes he heals bodies, sometimes he heals marriages, sometimes he heals broken hearts but he does heal. 10) “The Country of the Blind” is a short story written by H.G Wells. While attempting to summit the unconquered crest of Parascotopetl, a fictitious mountain in Ecuador, a mountaineer named Nunez slips and falls down the far side of the mountain. At the end of his descent, down a snow-slope in the mountain’s shadow, he finds a valley, cut off from the rest of the world on all sides by steep precipices. It was an unusual village with windowless houses and a network of paths, all bordered by kerbs. Upon discovering that everyone is blind, Nunez begins reciting to himself the refrain, “In the Country of the Blind the One-Eyed Man is King”. He realizes that he can teach and rule them, but the villagers have no concept of sight and do not understand his attempts to explain this fifth sense to them. Frustrated, Nunez becomes angry but they calm him and he reluctantly submits to their way of life because returning to the outside world is impossible. Nunez is assigned to work for a villager named Yacob, and becomes attracted to Yacob’s youngest daughter, Medina-saroté. Nunez and Medina-saroté soon fall in love with one another, and having won her confidence, Nunez slowly starts trying to explain sight to her. Medina-saroté, however, simply dismisses it as his imagination. When Nunez asks for her hand in marriage he is turned down by the village elders on account of his “unstable” obsession with “sight”. The village doctor suggests that Nunez’s eyes be removed, claiming that they are diseased and are affecting his brain. Nunez reluctantly consents to the operation because of his love for Medina-saroté. But at sunrise on the day of the operation, while all the villagers are asleep, Nunez, the failed King of the Blind, sets off for the mountains hoping to find a passage to the outside world and escape the valley. Sight is one of the greatest blessings that we enjoy. Since we are able to see from our birth we do not appreciate its value. Today’s Gospel tells us how Jesus, by healing a deaf and mute man, fulfills Isaiah’s Messianic prophecy, “The eyes of the blind shall be opened and the ears of the deaf unstopped.” (Fr. Bobby Jose). 11) Helen Keller and Annie Sullivan: We all know Helen Keller, whose story we read or watched in the play or movie The Miracle Worker. Helen wrote in her autobiography the key experience in her life: “The most important day I remember in all my life is the one in which my teacher, Annie Mansfield Sullivan, came to me. I stretched out my hand as I supposed it to be my mother. But someone took it, and I was caught up and held close in the arms of someone who had come to reveal all things to me, and more than all else to love me.” Annie Sullivan did give the child enormous love, but she also gave her firm and, at times, violent discipline. Annie’s combination of very tender and warm love and very stern and uncompromising discipline touched this child deeply and made her into a human being and a very great one at that. Even a cynical soul like Mark Twain, who got to know Helen Keller, reckoned her as one of the most interesting figures in the nineteenth century, because she had conquered her own physical limitations to become a beautiful and noble lady. In today’s Gospel, we see Jesus dealing with the man who was deaf and dumb, and we can receive many insights for our own life from contemplating the scene. (William Bausch in Telling Stories, Compelling Stories; quoted by Fr. Botelho). 12) Miraculous transformation: A working man was strongly drawn towards a beautiful vase he saw in a stall down in the town market. He bought the vase and brought it home. The vase was so beautiful that it made his front room look drab, dull, and indeed plain ugly. So he got bright paints and transformed the whole house. He got colorful curtains to match the paint, a brightly patterned carpet, and he even stripped down and varnished the furniture. Because of the beauty of the vase the whole room was transformed. – When Jesus enters my heart, the areas in need of attention become, oh, so obvious. Holiness consists in discovering that I am a much bigger sinner than I ever thought I was! The closer I come to God the more obvious the contrast! When Jesus comes to our lives, his touch, and his presence make all the difference! (Jack McArdle in More stories for Preachers and Teachers; quoted by Fr. Botelho). 13) The Buzzard, the Bat, and the Bumblebee: If you put a buzzard in a pen that is 6 feet by 8 feet and is entirely open at the top, the bird, in spite of its ability to fly, will be an absolute prisoner. The reason is that a buzzard always begins a flight from the ground with a run of 10 to 12 feet. Without space to run, as is its habit, it will not even attempt to fly, but will remain a prisoner for life in a small jail with no top. The ordinary bat that flies around at night, a remarkable nimble creature in the air, cannot take off from a level place. If it is placed on the floor or flat ground, all it can do is shuffle about helplessly and, no doubt, painfully, until it reaches some slight elevation from which it can throw itself into the air. Then, at once, it takes off like a flash. A bumblebee, if dropped into an open tumbler, will be there until it dies, unless it is taken out. It never sees the means of escape at the top, but persists in trying to find some way out through the sides near the bottom. It will seek a way where none exists, until it completely destroys itself. 14) Joshua Bell’s violin performance in a subway station: On January 12, 2007, at 7:12 AM, The Washington Post conducted an experiment you might have heard about. The experiment involved Joshua Bell, one of the world’s greatest violinists who performed for almost all the world’s orchestras. He was commissioned to play his $ 4,000,000 Stradivarius violin in a subway station in Washington, DC. So he dressed like a street musician looking for tips and sat in the subway station playing for 43 minutes. The Washington Post had a hidden camera to video the entire event. Out of the 1097 people who passed by him, seven stopped to listen! He received $32.17 in tips, not counting $20 he received from one person who recognized him. The story is an excellent illustration of what James tells us in the second reading and what Jesus teaches us by healing a deaf man. (Fr. Joe Robinson; from Guiding Light). 15) “I visualize where I want to be.” During a recent interview, American basketball star, Michael Jordan was asked to explain the reasons for his undaunting optimism and perseverance. He replied candidly, “Obstacles don’t have to stop you. If you run into a wall, don’t turn around and give up. Figure out how to climb it, go through it or work around it. I visualize where I want to be, what kind of player I want to become. I know exactly where I want to go and I focus on getting there.” In today’s first reading, Isaiah’s prophetic message offers his original audience a similar Jordan-like optimism and willingness to persevere. The people had run into a wall, as it were, and Isaiah was offering advice on how to scale it. (Sanchez files). 16) “I’ve always thought our Lord Jesus was a bit of a liberal.” With regard to the proper Christian understanding of law and regulations: “Ernst Käsemann (Jesus Means Freedom) tells the delightful story of a Church in Holland in a year which had seen rising tides and collapsing dikes. One particularly bad weekend, it was necessary for the town mayor to ask the pastor of the local Reformed Church to bring all of his people out to help repair the dikes on Sunday morning or else they might lose the entire town. The pastor called the Church elders together who discussed the matter and concluded that they had been commanded to keep the Sabbath holy, so if they perished it was God’s will, but they would not cancel services. The pastor then mentioned Jesus’ violation of the Sabbath law, hoping it might stimulate some further thought. To which one old elder says ‘Pastor, I have never before ventured to say this publicly, but I’ve always thought our Lord Jesus was a bit of a liberal.” (http://www.preachingpeace.org).